Here’s the “meaty” post I promised. Look at this mysterious object! 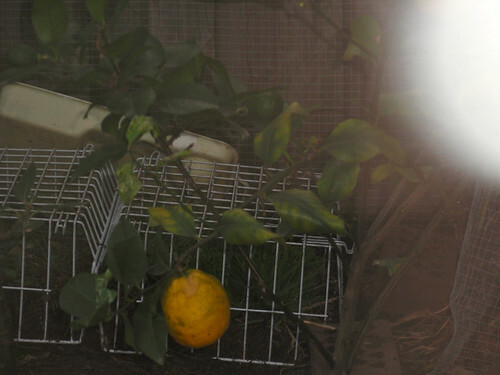 It’s a lemonade from my lemonade tree in the chook pen. I bought the tree from one of my forced trips to Ceres when David19 was attending a seminar at the Distance Ed school all the way over in the unreasonable suburb of North whatever-it-is and ever since it started sprouting these fruits I’ve been wondering when to pick them. They stayed green for MONTHS, but suddenly with the drop of temperature they went yellow. My enormous intellect is telling me that it’s a sign…. 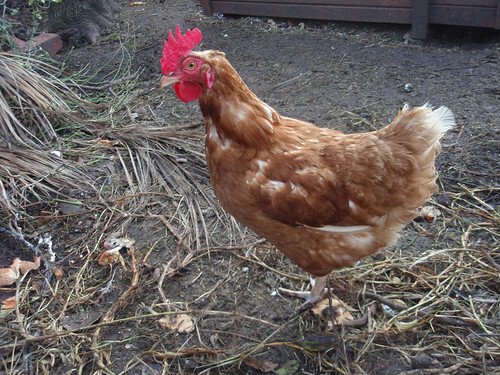 Here’s a chook, just to prove I still have them. All but one came out to greet me this morning. I figure Mrs Crankypants is either broody or dead. I didn’t have my chook run shoes on so I wasn’t going to go in and check. Later when I muck out the hen house I’ll find out. When she’s broody she’s even crankier than ever, so I’m not sure which outcome I’m hoping for. Is that a bit selfish? 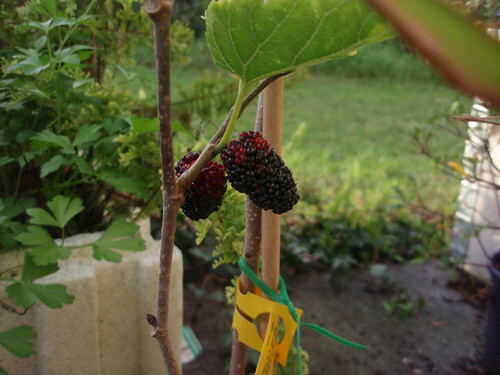 Here’s my next mulberry crop. I ate the whole crop just after I took this photo. It’s still in a little pot on my front porch, but maybe by next Spring it’ll be planted…? Ryan18 came staggering out a few days ago, having stayed up late to watch ‘Game of Thrones’ on his computer. He knows I haven’t seen this series, but he also knows I’ve read all the novels. I had to ask a few delicate questions to see where the storyline was up to, because there’s nothing worse than being a spoiler, but we reached an understanding and then the conversation was ON!!! I’m so glad my offspring are old enough to talk about REAL lit. Even if they get that lit from HBO and a computer screen. 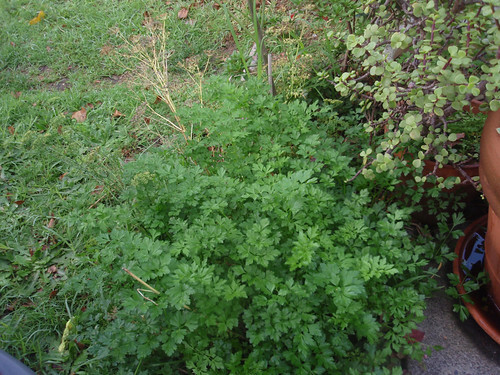 Here’s my Italian parsley crop under the lemon tree in the front yard. 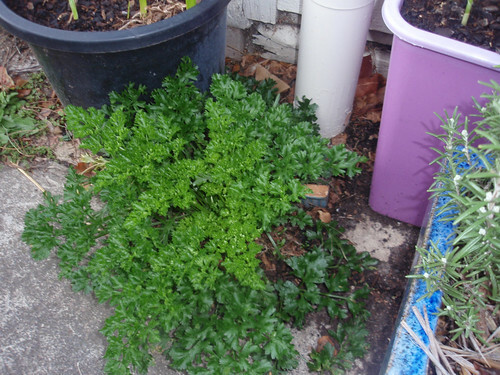 I have pots of parsley growing as well, but this little patch has really taken off. It’s not my favourite, though. This is. A seed from Blogless Sandy’s parsley took root and grew in a crack in the concrete. Somehow, I like the attitude of life against the odds. Plus it tastes good when I’m watering the pots in this corner. For your listening pleasure: the vocal track from ‘Under Pressure’ with David Bowie and Freddie Mercury. Fantastic. Look Bek! 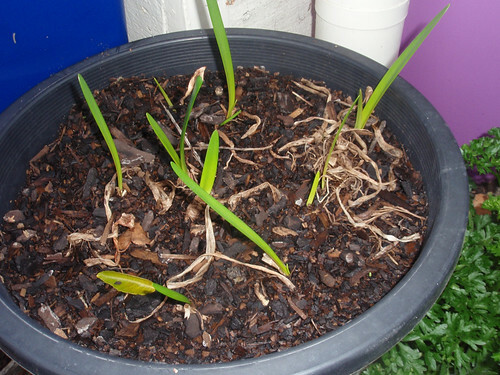 I have 10 or 11 saffron bulbs coming up now. This sad looking wicking box is an experiment. It’s my lemon balm box. It was looking very manky towards the end of summer so I cut it back and then buried most of the cut-back bits under piles of compost, as the soil had compacted over the year that the lemon balm had been in there. Bev told me that lemon balm was as tough as old boots, so I thought I’d see if it would push up through the compost and regenerate. 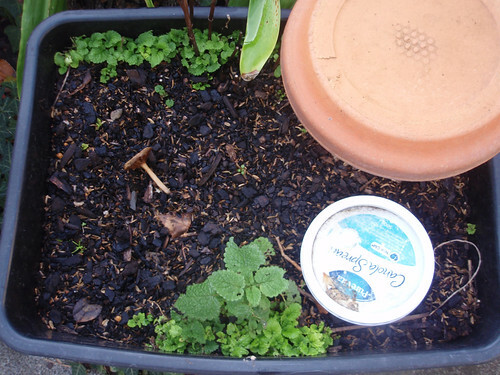 I didn’t want to lose my lemon balm altogether though, (Bev gave it to me when we first went to her food forest; it has sentimental value), so I left a couple of sticky-up bits towards the sides. You can see that the lemon balm is growing thickly around the sides now, but nothing has come up on the middle. This wicking box is going to look a bit like the top of a monk’s head come Summer time. 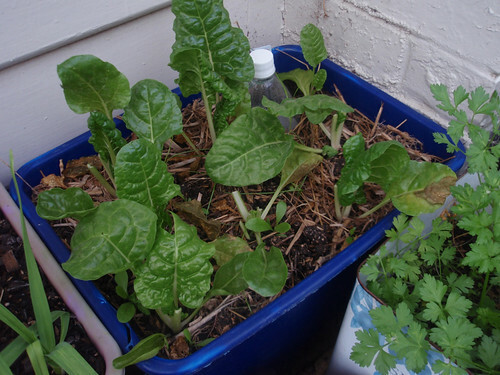 Finally, my over-planted wicking box full of silver beet. I know I’ve put too many plants in here, but I figure that if I keep on pruning them they’ll be fine. I came out here last night in the dark and picked some leaves to use on our home-made pizzas. I couldn’t see a thing and had to pick the leaves by touch. In the harsh light of morning it all looks a bit sad, but they’ll bounce back with a bit of worm-wee tea! Oh!! Almost forgot to tell you. I did an update of my grocery spending spreadsheet. From Jan 1 – May 31 my average weekly spend has been $100.05. This includes everything from the supermarket, butcher, feed store (hens) and takeaway. Pretty pleased with this. The spreadsheet also helpfully informed me that if I spent nothing else on food for the rest of the year, my average weekly spend would be $44 or thereabouts. I floated the idea past the boys but they didn’t seem all that keen to jump on board…. Thermomix recipe: Leftover Almond meal. For those planning on making the almond milk from the link I left last time, how about making almond flour with the leftovers? That’s what I love about the thermomix: no waste! This post also has a link to masses of recipes you can make with the almond flour, including some paleo dishes. Sadly, not a thermomix blog but easy enough to adapt. Enjoy! This entry was posted in books, chickens, Children., Fruit trees, gardening, Quality of life, reading, thermomix, vegetables, wicking beds. Bookmark the permalink. 3 Responses to Here’s the “meaty” post I promised. Yay! Saffron! Great to hear how its doing. You definitely have to break into half when kneading in the TM of this recipe as the half dough weight added up 990g. I had my olive dough weight approx 1300g (for 2 loaves) in the TM and it was just coughing in the TM bowl. There is nothing wrong to knead it by hand if you make a big batch per recipe. all my friends are dead too.